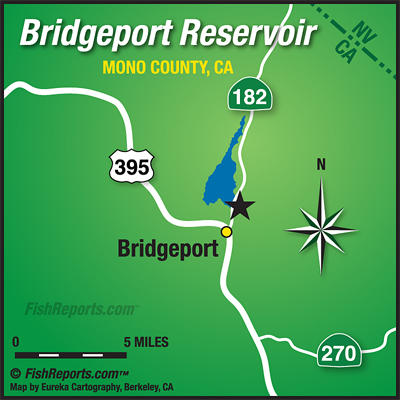 Bridgeport has fished great this past week, lots of nice fish in the 1 to 5 pound range. They're picking them up trolling, fly fishing and still fishing. The trollers have been doing well down near the dam with rapalas, kastmasters and thomas bouyants, bait anglers have been doing well with inflated crawlers, power bait and gulp eggs both from the shore near the dam and from boats in the Rainbow Point area and up near where the East Walker dumps into the lake. Fly anglers have been doing well mainly stripping streamers either near the dam or up along the weed beds near where the East Walker channel comes in.